It's that time again where I share some exciting crafters from Etsy! Today is our second blastoff of some talented crafters for you to check out! Happy Shopping and if stop by their pages, let them know that I sent ya! Is "3" really a crowd? Since finishing my recent summer class I was able to play catch up with some jewelry making. Below are some of my "newest" creations. I guess you can tell that three is a favorite number of mine?? Or coincidence...who knows, I had fun creating them and hope you enjoy! 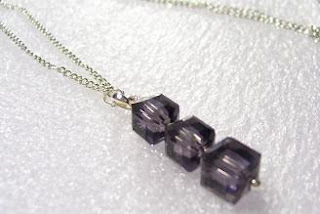 Elegant and Bold are three crystal cubed beads, separated by silver textured rondel spacers hanging on an 18 in silver-plated chain. A sophisticated look for evening, weddings or any time. 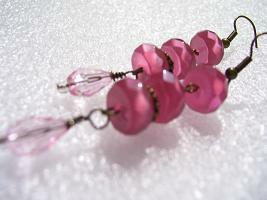 These vintage inspired dangle earrings have three round flat donut faceted glass beads dangling off of brass ear hooks. Partitioned by two brass spacers and adorned by a pink faceted tear drop. These earrings are light and won't tug on your ears. Measures 2.5 inches in length. Dainty and light, these gold-tone earrings are accentuated with figure eight link, spicy pink, pear and clear bicone faceted beads. Fun, sophisticated and bright! 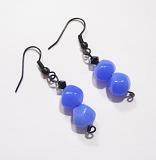 Blue is such a calm and relaxing color...when I found these beads I whipped up something pretty quick! Beaded with jet black bicone beads and a unique black clasp this Cerulean Blue Bracelet was derived. Next, I found black eyepins and coupled them with the remaining beads and black ear hooks to come up with these fun and sophisticated earrings! You can purchase either or both of these pieces at my Etsy, Bonanza or Simply Shop|323 Site!! This offer expires 11:59PM 5 Sept 2011! So hurry!